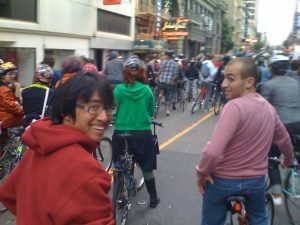 Three of us went to Critical Mass on a chilly February afternoon. 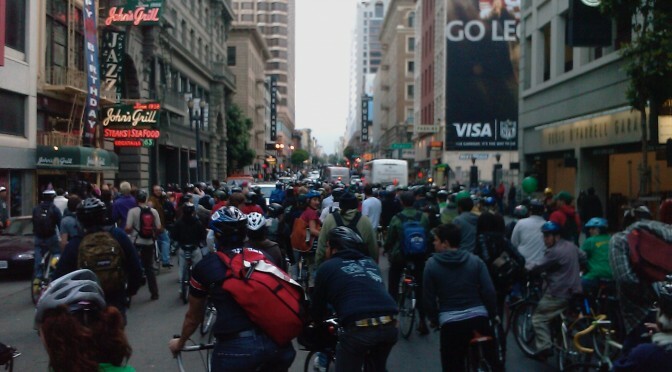 The legendary event was tiny — a dozen or so cyclists clustered in near the Ferry Building. With only two student, one of which is myself , and the professor, the journey to see Critical Mass on Friday February 25, 2017 was in my view underwhelming. There was a small turnout of people whom congregated in front of the ferry building. Professor Hunt informed me that sometimes there are crowds of cyclists, but this time was very small. I did not participate in the Mass nor anyone else in the group. We went to get coffee instead and talk about life. After coffee we all went away. The professor estimated that the cyclists would venture off around 6 pm, however coming out from getting coffee at around 6:30 the people at the “Mass” were still there. They hadn’t left. I did not stay to see them sent-off….